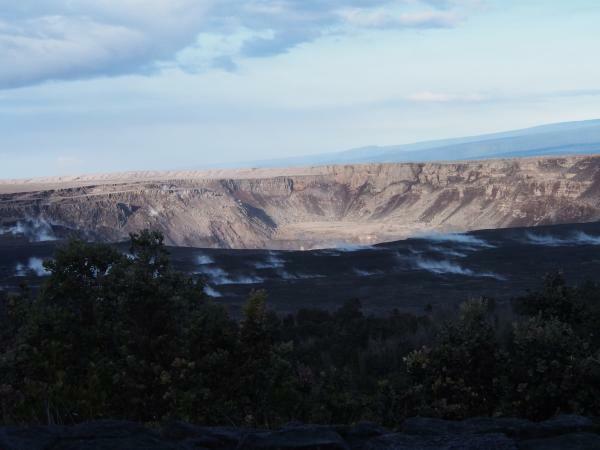 Kilauea’s double eruption continues with little change, except for a few more spillovers. Fissure 8 is feeding its lava river, which continues to ooze out along a broad front on the northern side of the delta and into Kapoho Beach Lots. Fissure 22 continues to spatter intermittently and send out a less-than-impressive flow. About a dozen Kapoho homes have succumbed to lava over the past week, and more are expected to go. 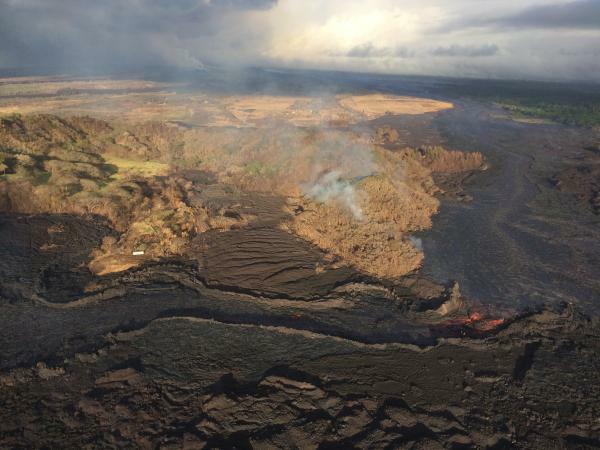 The National Weather Service also reports that there were about 1,200 lightning strikes between 7am and 2pm yesterday during Monday’s lava-boosted thunderstorm in Lower Puna. Today’s summit explosion occurred at 2:17am HST, with enough clouds that radar couldn’t find a plume (if any). Just to prove seismometers aren’t stuck, the magnitude registered as 5.1. Seismicity is back up to 20-30 quakes per hour after the lull. See below for a few more photos of this from the Hawai’i County Fire Department. 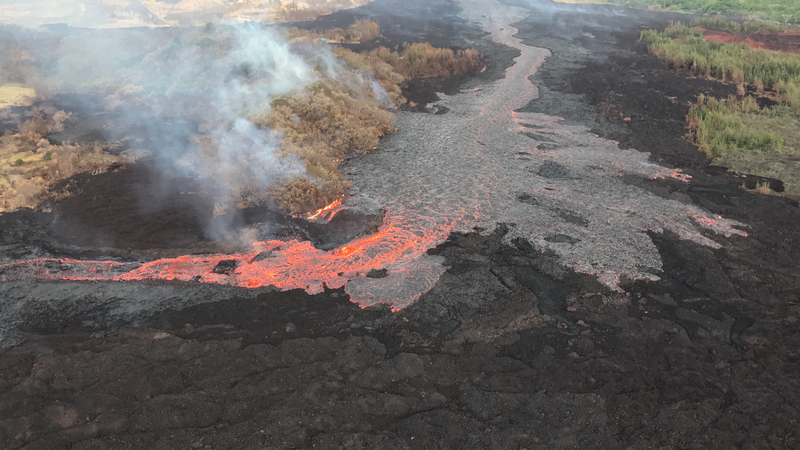 Monday, July 2, 2018, 5:45 am – Kilauea's east rift zone overflight: A number of breaches of the channels can be seen here, as the fresher lava appears more silvery than the older. 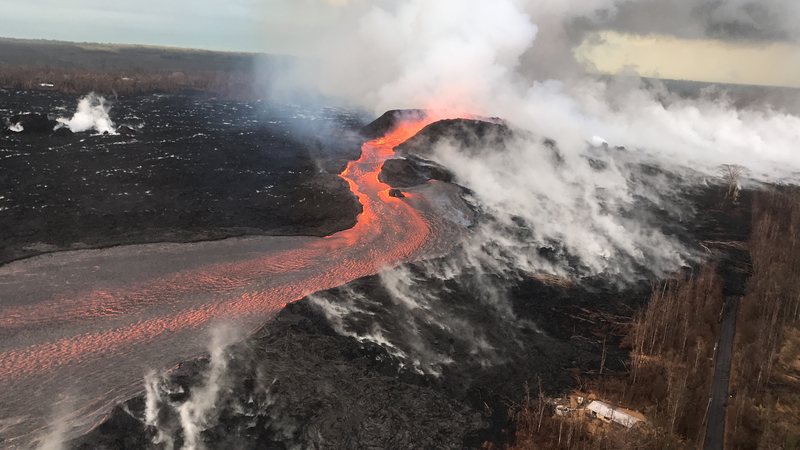 Monday, July 2, 2018, 5:45 am – Kilauea's east rift zone overflight: Homes and property in Kapoho are being consumed by the flow's expanding northern boundary. The latest summit explosion occurred at 1:24am HST July 2, the usual M5.3, with an ash plume ~1200 feet high. Immediately before, there were about 20-25 earthquakes an hour (a little less than in recent days) and dropped to 5/hour immediately afterwards (again, a little less). This post got long, so I’ve moved the Q&A session to Part 3. Again, I’m transcribing what HVO geologists had to say at the June 28 Volcano Village community meeting. Part 1 was Kyle Anderson’s talk on seismicity and ground deformation— lots of nitty gritty science— while Part 2 was Don Swanson’s slideshow of some of the visible changes he’s observed within Kīlauea Caldera, with a lot of photos I haven’t seen anywhere else. Here’s the video of the whole meeting.